I try to be a patient person. In general, I give people the benefit of the doubt, assume that they are well-intentioned. And for the most part, I think people do try to do what is right. But every now and then, I find that my trust is misplaced. It isn't necessarily that they are malicious. No, they may just be lazy, failing to do due diligence when really they ought to do at least some measure of basic research. Such was the case recently. I came across an article by Matthew Mientka in Medical Dailty titled Vaccines And Autism: Evidence Shows ‘Strong Link’ Between Autism And MMR Vaccine. When the post originally went up, the title was a bit different: Vaccines And Autism: New Evidence Shows 'Strong Link' Between Autism And MMR Vaccine. Notice the very slight difference? The word "new" was dropped after I called the author on some errors in his article. It all started when the article popped up in my google alerts. Mientka discussed "investigators at Utah State University" that "found evidence of an abnormal reaction to the vaccine in children with autism, providing some encouragement to parents who have refused to vaccinate their children with the typical three-shot regimen". The implication was that this was new research that found that, despite what the scientific consensus has been for many years, now, these scientists came upon some evidence that MMR actually does cause autism. The authors names were given, but Mientka failed to include the title of the paper or even a link to it. 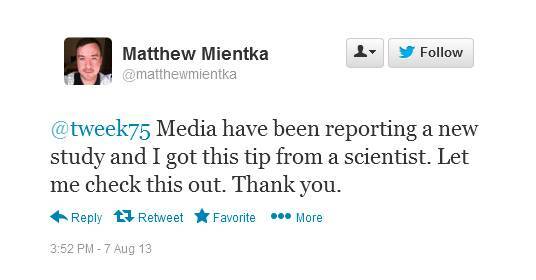 Looking Mr. Mientka up on Twitter, I sent a quick note to him, asking if he had a link to the study. I figured that it might be a little while before I heard back from him, so I started looking on my own. 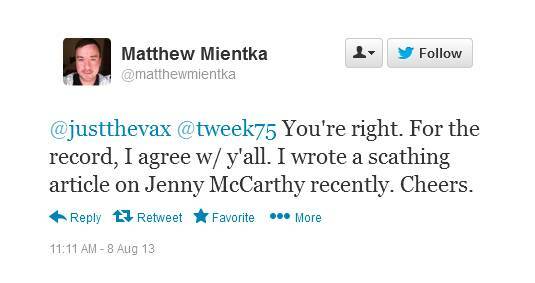 That's when I discovered the wee little error in Mientka's reporting. The study, by Vijendra Singh et al., was not new at all. It was actually eleven years old, having been published in 2002: Abnormal measles-mumps-rubella antibodies and CNS autoimmunity in children with autism. 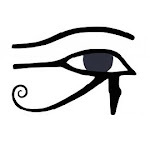 I pointed this fact out to Mr. Mientka, as well as to a study that showed there was no evidence of measles virus or abnormal antibodies in those with autism (No Evidence of Persisting Measles Virus in Peripheral Blood Mononuclear Cells From Children With Autism Spectrum Disorder, D'Souza et al., 2006). Finding this information took me less than 10 minutes. After discovering these error so early in the article, I didn't bother delving too deeply into the rest of it. Instead, I simply informed Mientka of the error, to which he responded that he would correct or retract the story if necessary. Great! I had hope that this was a journalist that would take the time to look a bit further into his story and make the necessary corrections, avoiding credulousness and false balance. Others quickly picked up on the problems as well, noting that Mientka's article was just rehashing a Daily Fail Mail article, also from 2002. Leaving aside for a moment the fact that the Daily Mail has a reputation for being a rag with, at best, questionable adherence to reality, they have a tendency to leave the date of publication off of their articles. The only way to somewhat reliably determine when one of their articles was published is to use their search utility to look for the article. Don't believe me? Click on the first of the two links just above. The only date is at the top of the page, suggesting the article was posted the same day you're viewing it. Now click on the second link. Note that the article was actually published on September 8, 2002. Correction, August 8, 2013: An earlier version of this story incorrectly reported as "recent" the findings of a 2002 study linking development of autism spectrum disorder in children with the measles, mumps, and rubella (MMR) vaccine, which was approved in 1971 by the U.S. Food and Drug Administration and manufactured by U.S.-based Merck. The rest of the article was unchanged. In the end, the reader is left with the impression that there is a study that actually provides strong evidence that MMR causes autism despite the study being horribly flawed, not replicated (in 11 years) and refuted by other, research. Mientka also leads readers to believe that the National Autistic Society in the United Kingdom questions the safety of the MMR and believes there is a link, despite the fact that they state there is no link. Despite my desire to believe that Mientka would actually do more research and take proper corrective action, he didn't. If he'd bothered to do even a modicum of basic research when he got his "tip", he might never have bother writing this article, since there is nothing to it. Mientka's article never should have been published in the first place. And now, the proper course of action would be for him to retract the entire thing. After all of the errors are corrected, what's left? A story about a study whose authors made conclusions not supported by the data. Quotes from an anti-vaccine spokesperson. And false statements about the position of a major autism organization in the U.K.
And lest Mr. Mientka think that there's no harm in this piece of lazy journalism, his article is already being picked up by anti-vaccine activists. For example, Age of Autism's hit-and-run Media Editor Anne Dachel has it on her blog and has let the echo chamber at AoA know about the Daily Mail version of the story, and it's been uncritically spread by anti-vaccinationists on Twitter as if the headline were true. I really did not want to write this post, pointing out all of Mientka's errors. When he said he'd correct and/or retract his article, I actually thought that it would result in more than simply removing "new" and pointing out that the study was rather old. Instead, all we got was a very minor and, in the grand scheme of the article, insignificant changes. The core, faulty message of the article remains the same. Mr. Mientka, if you read this, I really hope you'll take my critique to heart and do the right thing. Retract your article. I still hope that I'll be proven wrong, that you are not really that lazy and sloppy a journalist, that you have integrity. I'll write a follow-up post if you do take the actions necessary to make your article reflect reality. I hope I'm wrong. I fear I'm not, but I hope I am. As a side note, I had tried to comment, including links to the actual study and refutations, but my comment was never allowed out of moderation. UPDATE: As of 8:43am, August 9, 2013, Mr. Mientka has updated his post to correctly identify Jonathan Harris as being affiliated with JABS, not NAS. However, the way in which he is quoted still suggests that the comments are recent, rather than from 2002. All of the other problems with the article persist. UPDATE: As of August 15, 2013, the original article this post responded to has been taken down. For those who are interested, a cached version can be found here. Yes! That is the harm and it cannot be (totally) undone, just as you'll never be able to pick up all feather from a chicken you have plucked. Thanks for the heads-up. Still pretty sloppy, overall. He states, repeatedly, that MMR has (or had) thimerosal, which is completely wrong. Also links to a Geier study, showing he doesn't know anything about their history. Lots of broken links. Some of the writing is kind of rough. It doesn't seem like he proofread it or that an editor reviewed it before it went up. I noticed those errors, but my comment did not go through. Also, I noticed the original article is gone. Yeah. I tried to comment, too, but it didn't go through. Didn't even get a note that my comment went into moderation. Even though my comment did not get through, he did add this: "Contrary to what many believe, the MMR vaccine does not contain — and, in fact, has never contained — thimerosal." Well, I did mention it to him on Twitter, after which he updated his article. BTW, since he did retract his original post, I was true to my word and posted a followup.